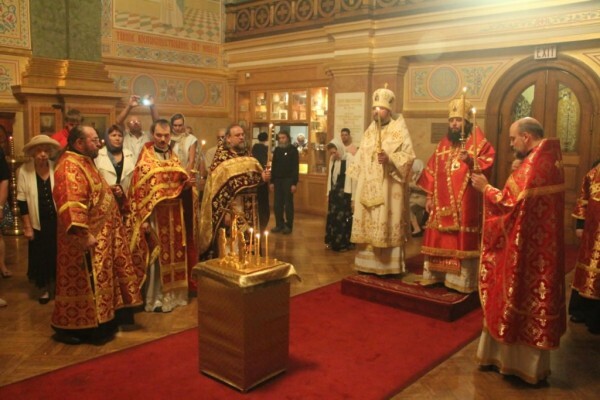 On Thursday, September 11, 2014, the feast day of the Beheading of St John the Forerunner, Baptizer of the Lord, Divine Liturgy was celebrated at St Nicholas Patriarchal Cathedral in New York City. Officiating were His Grace Bishop John of Naro-Fominsk, Administrator of the Patriarchal Parishes in the USA, and His Grace Bishop Nicholas of Manhattan, Vice Secretary of the Synod of Bishops of the Russian Orthodox Church Outside of Russia. With the blessing of His Eminence Metropolitan Hilarion of Eastern America and New York, the main holy item of the Russian diaspora, the Kursk-Root Icon of the Mother of God “of the Sign”, was brought to the service. Joining the archpastors at the service were the clergymen of St Nicholas Cathedral as well as Protopriest Andrei Sommer, Senior Priest of the Synodal Cathedral of Our Lady “of the Sign” in New York, Vice President of the Synodal Youth Department, and Protopriest Serafim Gan, Chancellor of the Synod of Bishops, Secretary of the Primate of the Russian Church Abroad. After the Gospel reading, Bishop John delivered a sermon on the topic of the feast day. After the Eucharist, the bishops and other clergymen performed a prayerful commemoration of those who died during the terrorist attack in New York in 2001. Bishop John the warmly welcomed Vladyka Nicholas, and asked that he relay his gratitude to Metropolitan Hilarion for blessing the visit of the miracle-working Kursk-Root Icon to St Nicholas Cathedral. In memory of the event, Vladyka John gave his brother archpastor a new book on the life of St Nicholas of Myra. In return, Bishop Nicholas gave Vladyka John a framed photograph of the Kursk-Root Icon without its riza. The celebration continued during a trapeza luncheon. The hierarchs discussed various topics relating to cooperation between the Patriarchal Parishes in the USA and the Eastern American Diocese of the Russian Orthodox Church Outside of Russia.